Pflanzenreich, IV, 129 (1912) 383. Compact half-shrub to shrub, 10-30(60) cm, profusely branched from the main stem. Semi-decideous. Stems glabrous, woody, lateral branches thin (3-5 mm), petioles persistent. Numerous leaves at the tips of branches, internodes up to a few mm. Leaf margin roundly dentate, cuneate, obovate to cuneate in outline, ~1 cm long and ~1 cm broad. With widely spaced short glandular hairs. Petiole ~1 cm, stipules triangular, 1x1 mm. 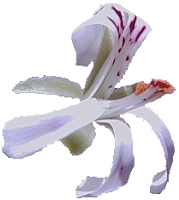 Flowers usually solitary or in pairs on a peduncle up to 15 mm, at the tips of branches. Pedicel 1-2 mm. 5, lanceolate, 7-10 mm long, 1.5-3.5 mm wide. Hypanthium 1-2.5 cm. Subequal, posterior recurved >90o, up to 20x5 mm with linear markings, obovate, anterior slightly smaller, slightly recurved. Colour: usually white, rarely pinkish or cream-coloured. 7 fertile, of four different lengths. An adult shrub at the beginning of winter just N of Namies in the Northern Cape. 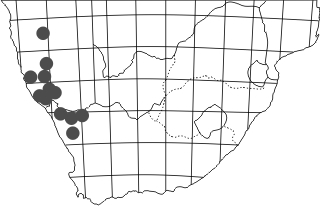 This is at the easternmost range of P. xerophyton distribution in an area where rainfall is already quite erratic and may happen at any time of year. It just so happened that this particular year was quite dry and the shrubs looked a bit sad. Quartzite patches around Pofadder and Namies are where the Karoo, Bushmanland and Namaqualand meet, with a wide variety of plants typical of all regions. Many plants here have stocks of water underground, or even entirely retreat underground for parts of the year. 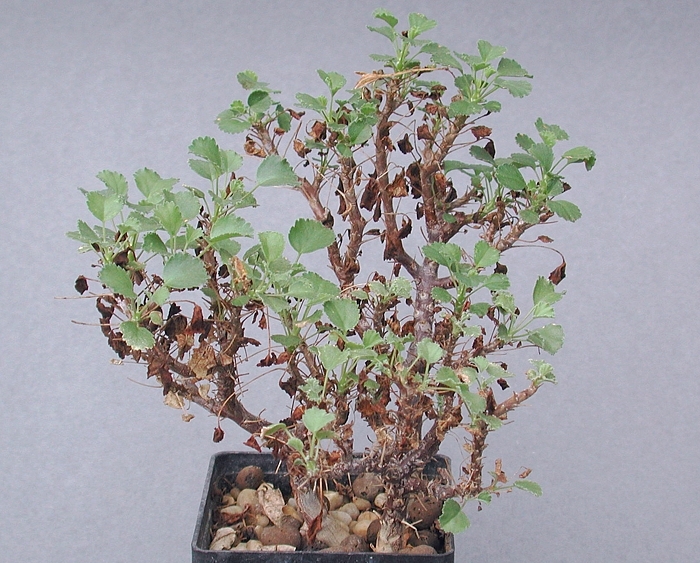 This Avonia quinaria hid itself from the sun, its tuberous root having shrivelled and pulled the stems below soil level. Other succulents have adopted the same strategy: to look for Lithops olivacea here means that one needed to look for round holes in the sand, into which the small bodies have hid their dry existence until the next rain. Just 70 km to the west, the plants N of Concordia looked much happier. 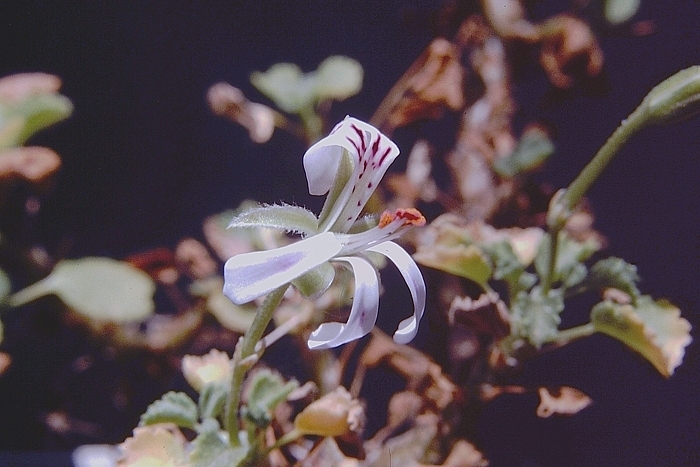 The posterior petals of these flowers are less sharply recurved and less conspicuously marked than what the description would require of them - however, these are still unmistakeably P. xerophyton. A terrible quality scanned slide from 1998 with an exceptionally large P. xerophyton of ~1.2 m height with the (now much older) author for comparison. 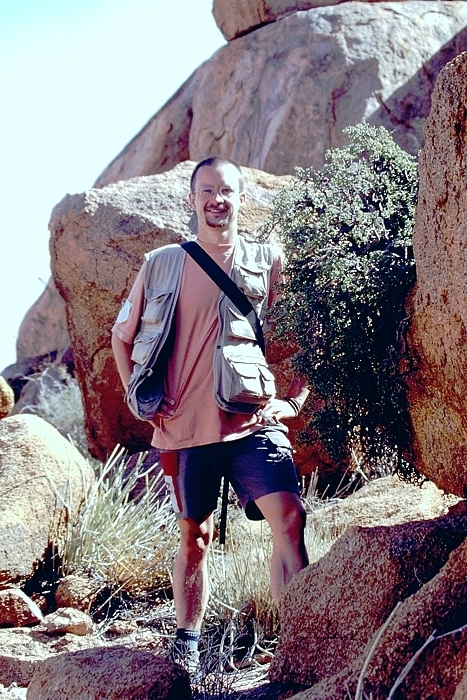 These plants were found on a mountain top just north of Aus in southern Namibia. If not grazed, P. xerophyton can grow into plants of a very respectable size.